Universal high-speed dental drill system. Reinvent the traditional dental drill with a triangular design bur shank for improved precision that meets Health Canada regulations. Develop test equipment to compare performance specs on existing drills to influence overall design and manufacturing process. Move from traditional friction fit drill bit to triangular bur shank. Provide ProDrive with fully functional prototypes for clinical user trials. Find quality suppliers for high-tolerance small turbine parts. Help source and select the right mix of manufacturing and component suppliers. Dr. Turner came to Design 1st wanting to reinvent the standard dental drill, an instrument used by over 150,000 dentists worldwide. 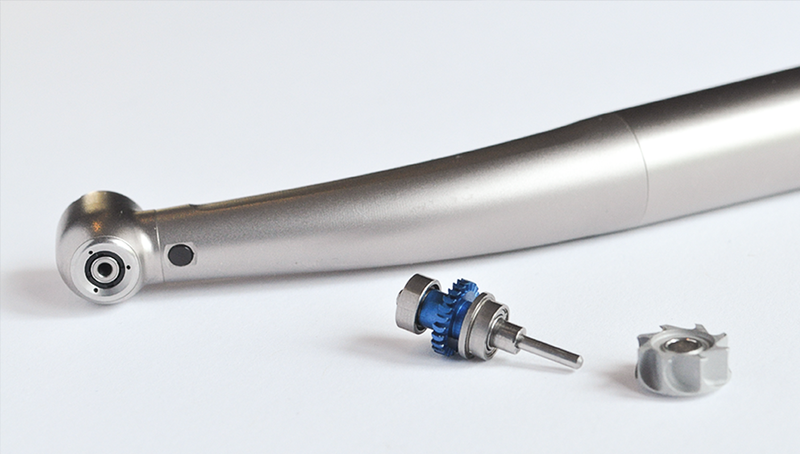 The goal was to provide a better experience for dentists and patients by moving away from the friction fit drill bit to a triangular drill shank bit and a snap-in locking feature. To develop the mechanical concepts for the new drill, Design 1st began testing existing dental drills on the market using a custom in-house testing jig developed to assess performance. 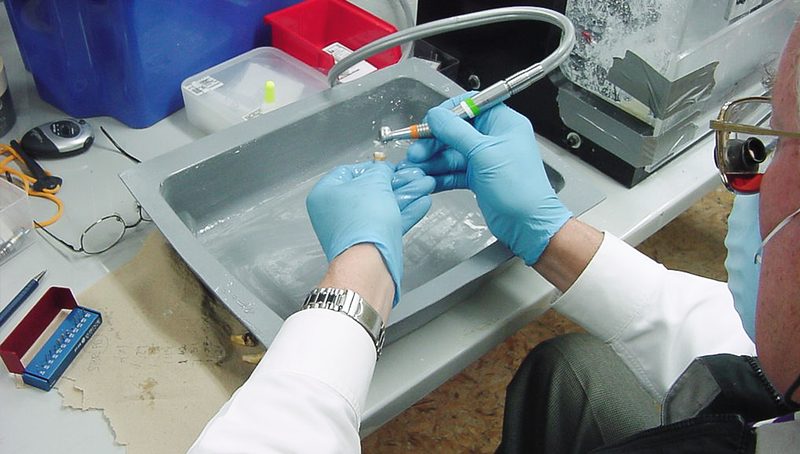 The test results were used to develop several manufacturable concepts that met Dr. Turner’s requirements. "Make the best drill in dentistry." 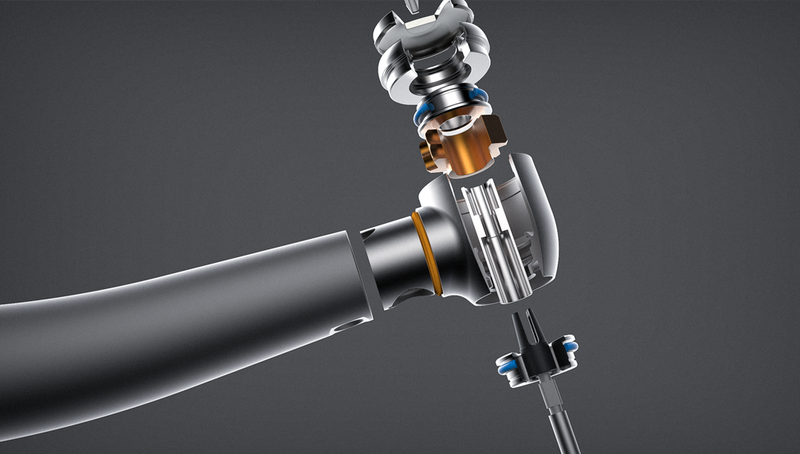 3D CAD model of new dental drill. "Exceeding speeds of 400,000 RPM." Building the design concepts into a detailed 3D CAD model was straightforward, the challenge was balancing the drill function with long-term performance. The new drill bit system would exceed speeds of 400,000 RPM with the parts so small you could lose them under your fingernail. The design solution was virtual FEA simulation of the mechanics to identify any problem areas and modification of the 3D CAD geometry to allow for variable drill length. This new snap-in 2 position drill length became a key patentable feature that helps Dentists achieve more accuracy and control. 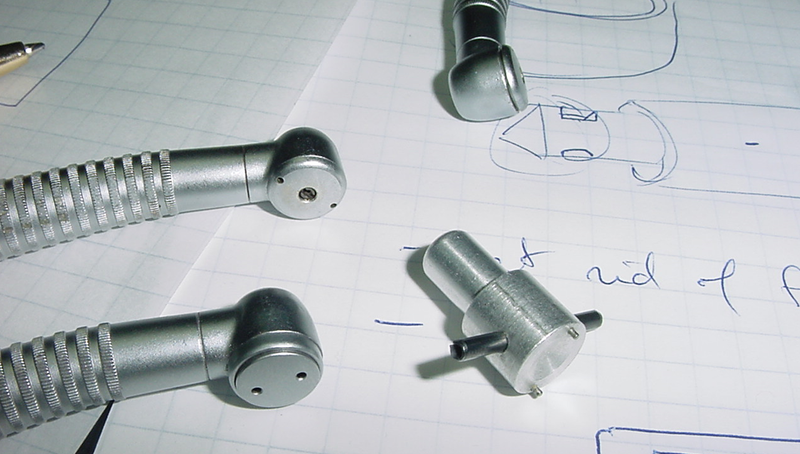 After 3D CAD geometry and design of drill parts was finalized, Design 1st began developing pre-production prototypes for clinical trials. The challenge here finding a supplier to create high-tolerance parts in low volume that met Health Canada and ISO 9001 regulations. After trying several North American suppliers who did not meet design and quality requirements, Design 1st sourced a state of the art factory in Germany to produce the parts, initially in low volume. Once received the drill systems were assembled and sent to Dentist offices across North America for clinical trials. "Sourcing for high-tolerance, low volume parts." "A record low <0.5% part defect rate." After receiving positive feedback from clinical trials, Design 1st began supporting ProDrive Systems with setup for volume manufacturing. This involved building the full documentation to support Health Canada and ISO 13485 regulatory approval, plus factory visits to Germany to validate manufacturing procedures. The result was consistent quality during volume production of the high-tolerance, microscopic parts that had a record low <0.5% defect rate and exceeded all standard warranty periods. - Dr. Derek Turner, Founder ProDrive Systems. The World’s Largest Collaborative E Ink Writing Device.